Rone Barton and Lou Agresta, two friends of mine, contributed to the Great City Campaign Setting from 0one Games. If you want to know more about TGCCS, check out Atomic Array 008. Following up on TGC’s success, 0one commissioned a series of adventures from the authors. 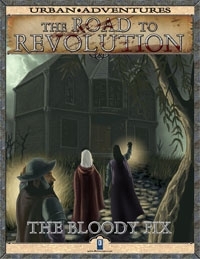 Rone penned the second adventure, The Bloody Fix. Go grab a copy, play it, and let him know what you think. If you want, drop my the new 0one message boards. The lightless warehouse alleys of the Trades Ward fester like the sour, fly-covered belly of an old nag. When the streetlamps dim, the wood-planked warehouses seem to stagger with their own decrepit drunkenness, and what little pity the ward can muster comes from beggars too poor to split a copper or toughs who gather in vacant storerooms to wager coins and chickens upon their fists. Is it any wonder then, why it sparks such a romantic attraction to off-duty military officers? For here, there are no lingering eyes of justice, no harsh penalties or judgments other than what a man can dole out with his own muscle. In a minute, a man can prove himself a primal warrior, or fall to the dust and tribunal humiliation of his silent peers. 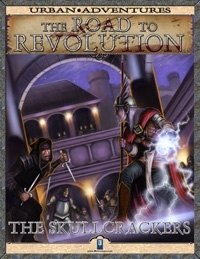 The Skullcrackers, written by my friend John E. Ling Jr., is a low-level urban adventure designed to introduce players to the Great City and is appropriate for four characters of 1st-level.